The Japanese character KI translates as “Life Force, Breath, Energy, Vital Energy, Spirit, Spiritual Energy, an entity that enables life and the existence of things in the universe.” In Chinese it is known as “Chi”. KI Martial Arts translates as Life Force, Breath, Energy, Vital Energy, Spirit, Spiritual Energy, an entity that enables life and the existence of things in the universe Martial Arts. KI Martial Arts believes that the development of the mind, body and spirit is essential. Training only the body is not enough. Character development, physical development, and emotional development are all enhanced when they are trained together. Karate (and All Martial Arts) is about building character. This is a discipline which has focus. The principles of Karate (and All Martial Arts) speaks to issues of character and spirituality, as well as the need for courage, honesty, perseverance, loyalty, trust, integrity, and humility; All of which find expression through Genuine Courtesy and Respect. Through the practice of Karate (Martial Arts) students will improve their coordination, physical condition, reaction, and self-discipline. Studying Karate, children will learn to manage interpersonal relationships, and learn how create a true atmosphere of friendship and respect. KI Martial Arts is dedicated to teaching all of the fundamentals of Karate (Martial Arts). Successful lives are built on these principles and fundamentals. Establishing this solid foundation aids individuals in developing a positive attitude and self-image, as well as strong, healthy relationships with others. Even more important, our students are empowered to achieve their life’s goals and desires. At KI Martial Arts we focus on quality instruction and individual attention to all of our students. All of our classes are taught by highly trained instructors. KI Martial Arts offers its students life enhancing benefits that will prepare them for a lifetime of success. 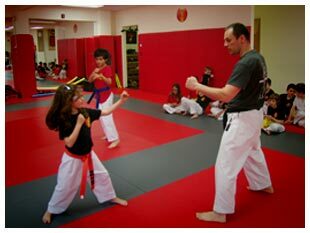 For children, as KI Martial Arts builds their self-defense and motor skills. They will also show improvement in social and intellectual skills. KI Martial Arts students will increase their flexibility, balance, and will dramatically improve their self-esteem and confidence. Listening skills, attention span and ability to follow directions will all improve, contributing to higher academic achievement. All of our students, from the very young to all of the adults, are treated with respect and taught to return the same respect to others.Our objective is to teach our students how to achieve mental and physical goals. KI Martial Arts teaches through positive recognition. We use praise, give encouragement, and use positive reinforcement to support the values parents teach at home. We have incentives for good academic report cards and students must maintain high grades at school to be promoted to higher rank. Children learn the value of setting goals and how to develop the perseverance and self discipline to achieve them. These qualities will help your child become successful in school, college, and life. Training in the Martial Arts develops our students physically. Our programs increase speed, stamina, and strength. They also develop balance, coordination, and timing, which in turn, will help in all other sports and activities. We promote non-violent resolutions to conflict. Our methods help children to explore and understand conflict through role-play and other exercises. Students will develop confidence, self-discipline, and self control as they learn how to act and react to the world around them. Positive Outlet for children’s energy – Many doctors have recommended Martial Arts because of the positive outlet it gives the kids for all their energy. In addition, our classes give children an incentive to stay fit, and healthy. Our martial Arts program teaches children essential self-defense skills – Our program teaches practical, proven self-defense methods. We also teach the kids that the skills they learn in class will work. We teach our students not to go home and try them on their family members or neighbors. We teach them about control and self-discipline. We teach that these skills are only to be used as a defense, and never to instigate a situation. These skills provide the student with confidence and a feeling of self-security that is perceived by the others around them. All of the skills we teach have of physical and mental benefits. 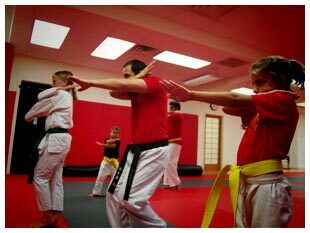 KI Martial Arts makes training fun and educational.